Like every priestly formation, the formation of the future members of the Community takes place in the course of well-determined steps which progressively introduce the responsibilities of the ministry and prepare for the priestly ordination. 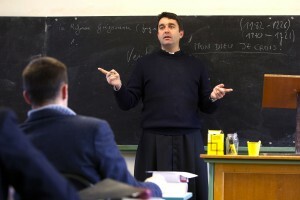 In the course of the formation process which lasts at least six years, the Church asks to distinguish the steps that marks the progress of the seminarian. If one omits the longer or shorter period of maturation of the vocation in the world, as well as the initial propedeutical year at the seminary, the direct formation to the priesthood contains two large phases: the first cycle (two years of philosophy studies) and the second cycle (three years of theology studies). The first cycle lasts two years. Like for the propaedeutic year, the maturation of the discernment of the vocation constitutes one of the major objectives of this first time of the formation. 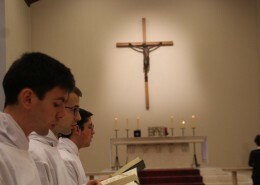 In order to deepen his discernment, the seminarian is during these two years invited to personally appropriate that which is given to him to live spiritually, humanly and as a community. At the end of the first cycle, the seminary council invites the seminarian to perform a pastoral internship during one year in order to confront his vocation by taking into account actual pastoral realities. The vocation has to personally appropriated. Forge oneself into a soul of a pastor begins by listening to a master. The second cycle lasts four years. Its principal objective consists in forging souls of pastors attached to Christ and to the Church, having acquired the necessary competencies for the priestly or diaconal ministry. In this cycle, the seminary therefore welcomes seminarians which have taken a firm orientation towards the priestly ministry, verified and approved at the end of the pastoral internship by those in charge of the formation. In the course of the third year, the admission of the candidates to the sacrament of Orders validates officially this preparation to the priesthood. 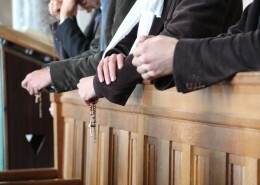 It is an important step in the sense that it is the Church who poses a first judgment regarding the vocation and the aptitudes of the candidate. In the course of the fourth and the fifth year, the seminarians will continually be instituted as lectors and acolytes, if their path do not present any major difficulties or profound questionings. These institutions are significant moments not only for the candidate but also for the whole of the Community, in the measure that by their liturgical and ecclesiastical dimension, they remind everyone of the finality of the formation. 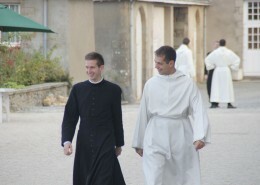 Generally, it is during the end of the fifth year that the seminarian may make his request of diaconal ordination. This step is accompanied by the definitive commitment to the celibacy and, for the seminarians of the Community, of the incardination to its bosom. Finally, at the end of the diaconal year which marks the end of the initial formation, the candidate may make his request of priestly ordination, if he estimates that he is ready to be configured to Christ the Priest. He may also postpone it in order to improve himself and achieve his maturation. 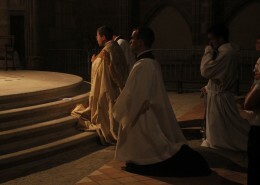 Christmas : Discernment retreat for young men HOW DO I KNOW WHETHER I AM CALLED TO BE A PRIEST?